The Ritual, Netflix’s newest original horror film, began streaming on Friday the 13th this past October; you really couldn’t pick a better date to release a good scare, and a good scare it is. Written by Mr. David Bruckner (V/H/S; if you haven’t seen it, finish reading this, then load up Netflix immediately you uncultured swine) this creepy addition to your horror library is based on a book of the same title by one Adam Nevill. Even being the bibliophile that I am, I must admit to having somehow missed this gem on the shelves, a trespass soon to be rectified, I assure you. The Ritual starts off fairly unoriginally; four friends backpack to the middle of nowhere and decide to take a shortcut through the woods — your basic scary set-up. Honestly, I was bored for the bulk of this film’s first hour. There were bits and pieces here and there that kept me going — a few frights, a little blood and guts — but on the whole it was just barely enough to keep me interested. I’m an avid horror fan and I am so tired of the repetition in the genre these days. That being said, the last thirty-minutes are where The Ritual sings. The originality I was looking for makes an appearance at last in the film’s climax. Pulling influences from Norse mythology, the threat is exactly as scary as they want you to think, taking the form of what is by far the most nightmarish and unsettling monster I think I’ve ever seen. I mean, this thing is menacing in all the right ways. I won’t give anything away, as I want you to be as genuinely spooked as I was when I first saw it, but it is the creation of a deliciously twisted imagination. The monster and the last few scenes are what save this movie from being a flop, and while I do understand how important it is to make a lasting impression in those final moments, I just wish they’d managed to fill out that first hour a bit more. As we all know, the plot is not the only integral part of a good film; bad acting can sink a cinematic ship as quickly as anything else. I’m happy to report this is not the case for The Ritual; the actors play their roles extremely well. There are no shining stars, but there aren’t any duds either, and everyone carries their weight. The dialogue feels natural, and there are no awkward line deliveries that jar you out of the experience. I recognized each of the four main characters from something or other, but none of them have had any large roles that I was familiar with. They make the emotion real, whether it is loss or terror, each actor keeps us in the moment, which is something especially important in a horror movie. Don’t give away the fact that you’re screaming at a tennis ball. The production quality of The Ritual is, surprisingly, very good. From camera angles to small, subtle on screen cues, there were plenty of times I was caught off guard or had to do a double take. There are a few jump scares, but they aren’t used too heavily and are actually startling instead of predictable. But the best parts are the silently horrific scenes. They didn’t need the loud music or sudden frights; when the score stops and the camera starts that slow pan, you’re in for it. They chose Romania as their filming location to depict northern Sweden, and while massive and beautiful, rolling hills and dense forests in the middle of nowhere have been done. I do understand the necessity for the setting here — the monster simply would not have held up in any other type of landscape — but it’s so hard to forget every other horror film I’ve seen in these exact surroundings. But despite how routine the setting is, the crew did well with what they had. The feeling of solitude slowly descends throughout, moving our trees and hills from picturesque to foreboding. I’m a nature lover, but you wouldn’t catch me in these woods for all the money in the world. The trees themselves look mean, like they’re ready to take a chunk out of you if you get too close. The atmosphere created by the lighting and camera use are actually pretty unsettling. There are a number of wide shots that remind you just how immense the forest they’re meandering through is, reinforcing that sense of loneliness and just how dire their situation could be. I appreciate the fact that a large majority of the best scenes are not in complete darkness; there is something to be said for a movie that wants you to be able to actually… I don’t know… see something? I can assure you, the scares do not suffer at the hands of the sun. Whether daylight is sifting through the trees or everything is cast in shadow, the sinister atmosphere is never lost. This has as much to with the sound production as it does the camera work; they chose an excellent score for this film. The music is never too over-the-top and works to set up a scene just as much as any prop, actor, or angle. I HATE a jaring music addition to an otherwise well thought out sequence; this common mistake simply does not occur in The Ritual. The notes flow right along with the moment, filling in any gaps and driving home the intended emotions. 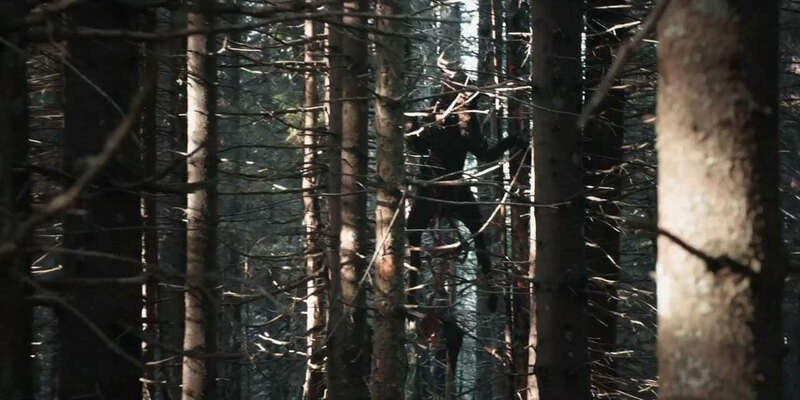 The Ritual may not be the best horror film I’ve ever seen, but it is, by far, not the worst. There’s not an overabundance of blood and gore, but this isn’t that type of horror; unsettling is the name of the game here. This movie is meant to send you to bed with the heebie-jeebies for psychological reasons, not over a little bone and viscera, and it accomplishes that. There is a message behind The Ritual which will become apparent to most near the end, one that plagues one of our main characters in a delightfully cruel way, and I think it adds that much more to the macabre feel you’re left with. Even though it’s far from perfect, I would still recommend giving this movie a watch. The last chunk is truly worth the time and the monster is just plain disturbing. If you enjoy a fresh twist on old horror tropes, this one’s for you. The Ritual is slow moving, but has a huge payoff in the end. With creepy scenery, eerie music, and a monster that'll give anyone pause; The Ritual is a good pick for horror fans.